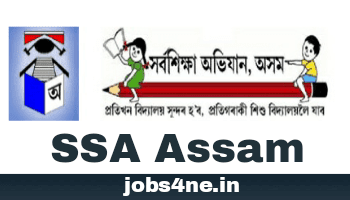 SSA Assam Recruitment for 7042 Nos. Assistant Teacher Posts for TET/ CTET Qualified Candidates. - Jobs4NE : Jobs in Assam and North East India. SSA Assam Recruitment for 7042 Nos. Assistant Teacher Posts for TET/ CTET Qualified Candidates. Online applications are hereby invited in prescribed format from LP & UP Teacher Eligibility Test (Elementary)/ CTET qualified candidates who are Citizens of India as defined in Article 5 to 8 of the Constitution of India and permanent resident of Assam, for filling up of following positions of Assistant Teachers at Lower Primary and Upper Primary School on contractual basis under the Sarva Shiksha Abhiyan, Assam as shown in the tables below. The category wise number of vacancy may increase or decrease after obtaining approval from concerned Department. The posts are mainly available in remote areas of Assam and the interested candidates must be physically and mentally ready to serve in these remote areas. This has the approval of the Education Department, Govt. of Assam. Starting date of online application: 03-07-2017. Last date of online application: 15-07-2017. (b) 1-year Bachelor in Education (B.Ed) for appointment of a Teacher on Classes VI to VIII. Considering the above relaxation, (i) CTET/ TET (Elementary) qualified candidates with at least 50% marks in Senior/ Higher Secondary (or equivalent) will be eligible for applying for the post of Assistant Teacher of Lower Primary Level and CTET/TET (Elementary) qualified candidates with Graduation will be eligible for applying for the post of Assistant Teacher of Lower Primary Level (ii) CTET/ TET (Elementary) qualified candidates with at least 50% marks in Graduation (from UGC recognised University) will be eligible for applying for the post of Assistant Teacher of Upper Primary Level (besides the NCTE notified professionally qualified candidates. 1. Assistant Teacher for Lower Primary School. 2. Assistant Teacher for Upper Primary School (Social Science). 3. Assistant Teacher for Upper Primary School (Maths and Science). Total no. of posts: 7042 Nos. 1. Assistant Teacher for Lower Primary School: 5854 Nos. 2. Assistant Teacher for Upper Primary School (Social Science): 911 Nos. 3. Assistant Teacher for Upper Primary School (Maths and Science): 277 Nos. At least 45% marks in Higher Secondary (or its equivalent) with LP- TET/CTET and 2-year Diploma in Elementary Education (by whatever name known), in accordance with the NCTE (Recognition Norms and Procedure), Regulations,2002. Graduation from UGC recognized University with LP- TET/CTET and 2-year Diploma in Elementary Education (by whatever name known) from recognized institutes. [5% relaxation of marks for SC/ST (P)/ST(H)/OBC/MOBC & PH candidates]. (Recognition Norms and Procedure), Regulations issued from time to time in this regard. B.Sc. with at least 45% marks from UGC recognized University with UP- TET/CTET and 1-year Bachelor in Education(B.Ed.) from recognized institutes/University in accordance with the NCTE (Recognition Norms and Procedure), Regulations issued from time to time in this regard. B.Sc. with at least 50% marks from UGC recognized University with UP- TET/CTET and 1-year Bachelor in Education (Special Education) from recognized institutes/University. Application fee: The candidates are to deposit an amount of Rs. 200/- [Rs. 150/- for SC, ST(P), ST(H) candidates and free for BPL candidates] in the form of Indian Postal Order (IPO) in the name of Mission Director, Axom Sarba Siksha Abhiyan Mission, Kahilipara, Guwahati-19. The candidates must have to submit the detail of IPO in the online application and the original IPO at the time of document verification only to the District Level Screening and Verification Committee of the applied district. Age Limit: A candidate must be not less than 18 years of age and not more than 43 years of age as on 1st January,2017. Relaxation of upper age limit will be applicable for SC, ST (P), ST (H) & PH candidates for another 5 years, as per Govt. of Assam OM No. ABP.06/2016/04, dtd 03.03.2016. 1. The online application and documents submitted by the candidates will be verified along with their original testimonials, in the respective Districts by the District Level Screening & Verification Committee. The District-wise detailed schedule of verification of documents will be notified in the Notice Board of the Office of the District Mission Co-ordinator (SSA) concerned. No TA/DA is admissible for appearing in the verification process. 2. The District level verification will be held in the respective districts ( District Mission Office of SSA) from 20.07.2017 to 31.07.2017. In case of candidates applied in the district of Biswanath, Charaideu, Hojai, Majuli, South Salmara, they will have to verify their documents in the District Mission Office of SSA, Sonitpur, Sivsagar, Nagaon, Jorhat, Dhubri respectively. 3. The regular or contractual teachers working in Lower Primary schools are not allowed to apply any posts in Lower Primary schools. The regular or contractual teachers working in Upper Primary schools are not allowed to apply any posts in Upper Primary schools. However, regular and contractual Lower Primary teachers if otherwise eligible may apply in Upper Primary schools. 4. In case of detection of application of already working teacher as mentioned in the point no.5, even after the issue of appointment letter will result in cancellation of selection of such candidate. 5. A candidate can apply only in one district mentioned above. 6. In case of differently able (PH) candidates, only Orthopedically Handicapped candidates may apply. 7. The Contractual teachers will get all facilities including leave & other allowances as per Government norms. 8. There shall be reservation of post for SC/ ST (Plains)/ ST (Hills)/ OBC/ MOBC/ Physically Handicapped candidates as per norms. 9. The procedure of selection shall be as per Government rules. Marks obtained by the candidates in TET/CTET, academic qualification, professional qualification and excellence at NCC (B or C certificate), Sports (participation in recognized sports at National Level representing Assam), Fine Arts and Cultural activities (representing the State officially at National Level) will be taken into consideration for preparing the district wise select list. There will be provision of mark (as per norms) for NCTE recognized professional qualification (priority) as per clause 1. (iii) of the Notification vide F. No. 18-1/2015-EE 4, dated. 13.04.2017. 10. The teachers who will be engaged through this advertisement under the relaxed qualification norms will have to acquire the minimum professional qualification specified in the NCTE notification within 31st March. How to Apply: The eligible candidates shall apply online in the website www.ssaassam.gov.in from 10 AM of 03/07/2017 to midnight of 15/07/2017. No offline application will be received. i.Candidates are requested to confirm their eligibility before purchasing of IPO/submission of online application as the IPO/ amount of IPO is not refundable if the candidate found to be ineligible during the verification process. ii.After successful submission of the online form, candidates shall take a print out of the form and submit the same along-with self attested copies of mark sheets and certificates in support of educational qualification, caste, disability, TET/CTET, professional qualification (D El Ed/ B.Ed) and Co-curricular activities at the time of documents verification before the District Level Screening and Verification Committee of the concerned District. iii.Candidates should be very cautious while submitting the online application form as once the online application is submitted against a particular Roll number of TET/CTET, he/ she will not be allowed to submit the online application form for second time. iv.After submitting the online application form, the candidate will get a Unique Number against the submitted application. The candidate should keep the record of the Unique Number for all future reference. v.The candidate should note that failing to appear before District Level Screening & Verification Committee for verification of documents on the scheduled date and time will result in cancellation of his/her candidature. No further communication in this regard will be made. vi.The Office will not be responsible for any lapse in submission of online application due to any technical problem. a.Pass certificate and Mark sheet of Higher Secondary and Graduation. b.Pass Certificate, Admit Card and Mark sheet of High School Leaving Examination. f. Candidates with disabilities (Orthopedically Disabled) will have to enclose certificates of disabilities. g.Certificate of NCC (B & C certificate only), Sports, Fine Arts and Cultural (Representing State at National level). viii. The teachers (Contractual), so selected will have no claim for any appointment whatsoever against any regular vacancy or permanent absorption in the school or in the Education Department in future. ix.The teachers will be posted in the schools having the medium of instruction as per the medium (language-I) of the candidate in the TET. x. Only Bengali/Hmar/Manipuri/Hindi medium TET qualified candidates will be eligible to apply in the posts of Barak valley districts.